About mid-afternoon Gene and Jason left Cordell for an initial target area near Woodward OK. Chasing prospects seemed rather marginal with a rapidly advancing cold front likely to quickly undercut any initial super cell structures along that boundary, the dry line firmly capped and rather meager moisture return. That said, the chance of a storm near the intersection was non-zero, and if anything did develop it was likely to be photogenic. Not far to go, so we decided it was worth the risk. We arrived on target shortly after 5:00 pm CDT to some weak, high-based convection in the area. Setting up along US 183/270 to wait, we observed several cells try, for the most part unsuccessfully, to get established. When they did get established, their lives were brief - a bit of precipitation and little or no observable lightning. 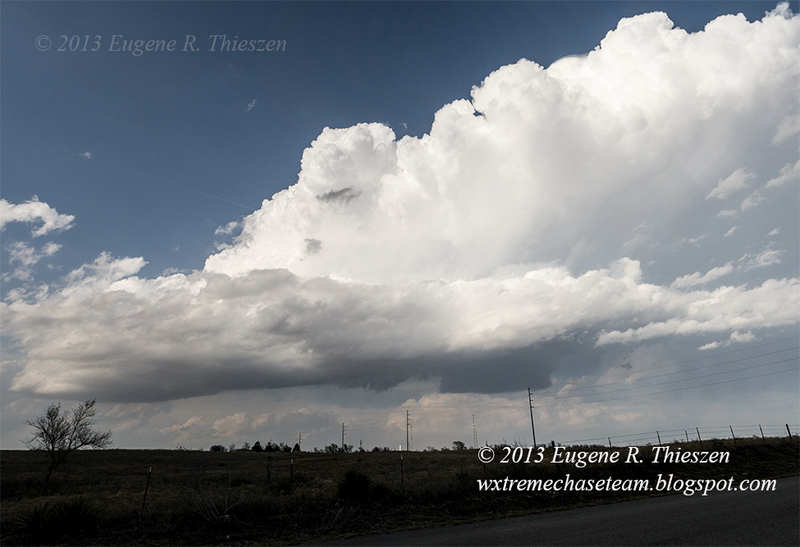 Struggling convection at 5:48 CDT near Woodward in high-shear, low instability environment. As each successive round of convection made its attempt in new areas a bit further S and W, we noted a trend of increasing strength. Eventually a storm that developed in the Arnett area just W of US 283 was strong enough to be severe-warned. 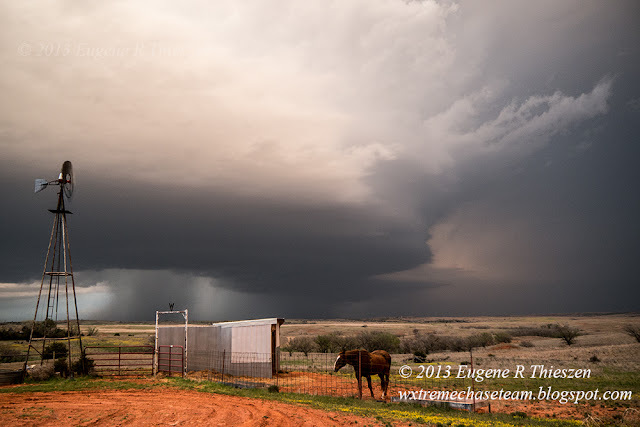 As it moved NE and we headed that direction, the initial severe storm rapidly weakened and we wondered if perhaps we should have trekked north toward the twin supercells in the Hardtner, KS to Alva, OK area that we had seen developing from our vantage point near Woodward. However, as the first Arnett storm dissipated, another storm developed W of it in the far eastern TX panhandle and after a few radar sweeps began to show a super-cellular signature as well as improving visual structure. It continued to gain strength, and a wall cloud developed shortly before we parked on a well-field site just E of Arnett. 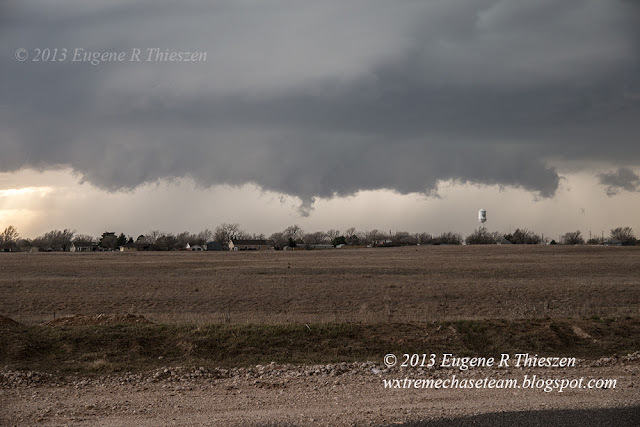 On occasion, the rotation tightened up a bit and we observed some ragged funnel clouds, but the tornado threat did not appear to be significant. In any case, our patient wait and sticking to our target area was well-rewarded! 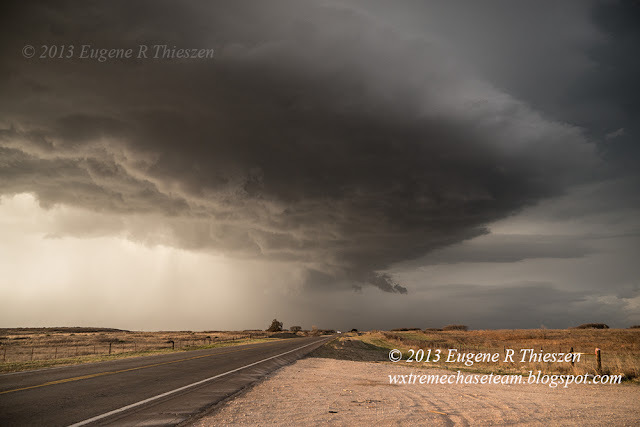 As the storm motion became more and more southeasterly we drifted S on US 283, pausing to observe and photograph, but staying just out of the hail and precipitation. That was wise, to say the least. Hail up to 2.5" was reported not far from Arnett! 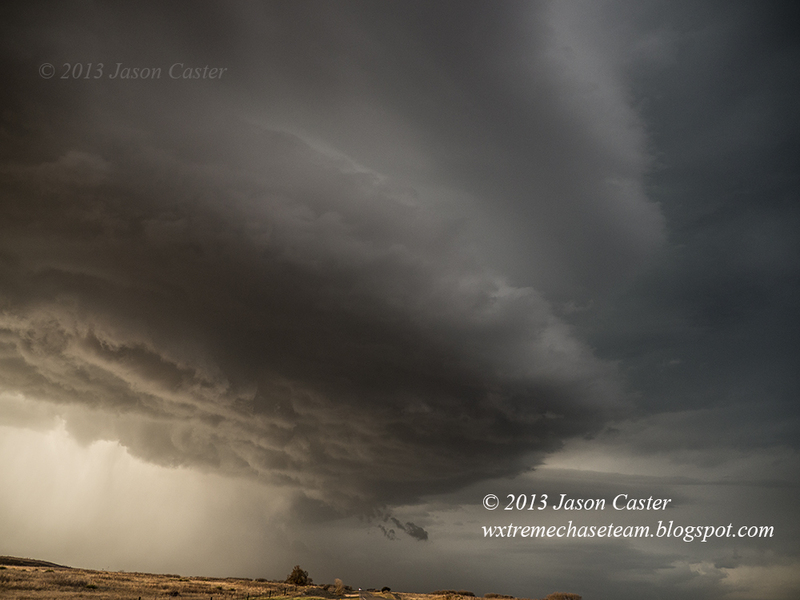 In the second and third photos below, the hail shaft is obvious. As the storm crossed US 283 in Ellis County we needed to leave it behind for a bit, since there were no good E options until the little town of Roll which was a few miles S of the Canadian River. 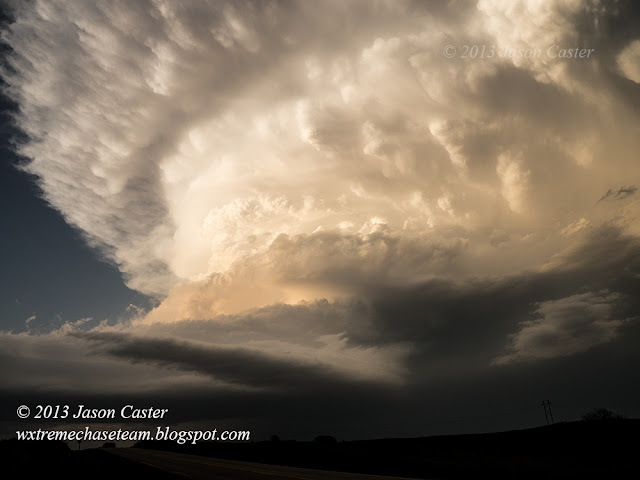 That necessary detour resulted in some excellent views of the entire supercell...some real "WOW!" moments. Below is one of Jason's excellent photos. After reaching Roll, we drove E on SR 47. The road angles NE for a few miles at one point and with the now directly SE movement of the storm, we were very quickly in a position for some more good views of the updraft base. At this point, the storm sported a barrel-shaped updraft with rain and hail falling through the RFD. 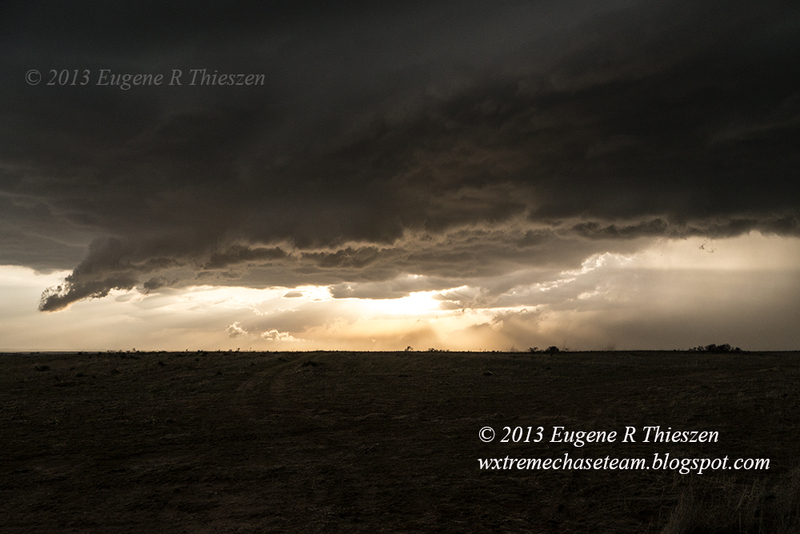 As darkness fell, we pulled off of SR 34 just S of Leedey to enjoy the magnificently sculpted storm as it remained severe, but became less and less surface based. 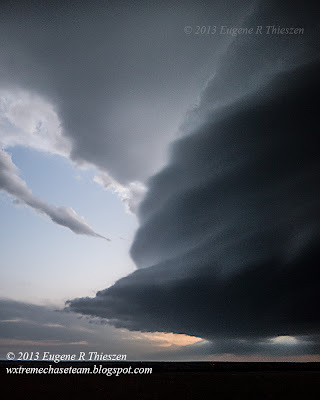 A couple views - the southern edge and the northern edge of the updraft. 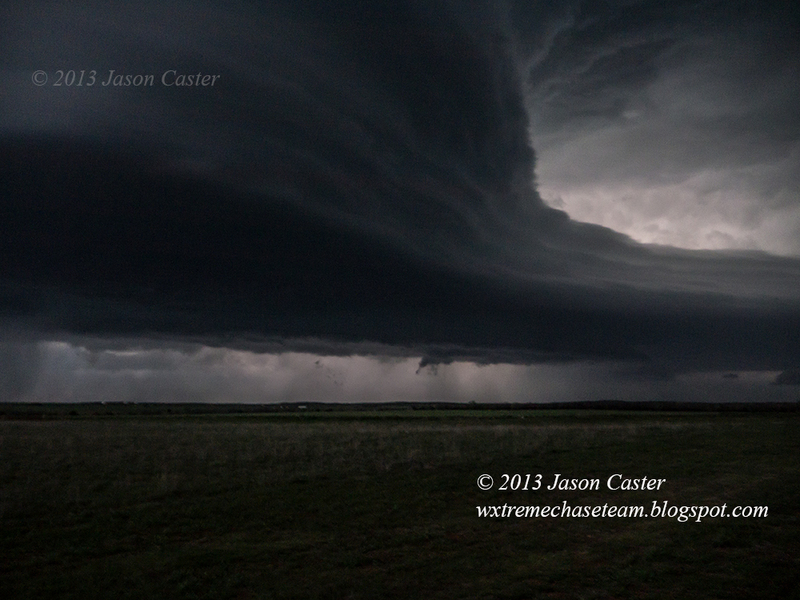 Notice the substantial beaver-tail extending NE. After watching a while we decided to head S and E further away from the storm to try our hand at some lightning photography, but unfortunately the cloud to ground lightning strikes were few and far between. So we brought our chase to an end. A surprisingly satisfactory chase on a marginal day. Team Chase: Eugene Thieszen and Jason Caster.